This lovely four bedroom house is nice and spacious and has a good sized garage as well as 1280sqm of land. The property has a large loft space which could be converted into more living space but would make a really nice master suite making this a large five bedroom house. To the front of the property, there are two doors, one that leads into the living room or another that leads into a spacious hallway. At the moment, the kitchen and living room are not connected but there is a wall that could either be knocked down or made into an archway that could open up the two spaces making it an open space kitchen diner with good views over the garden given by the patio doors in the living room. The kitchen is big, has a large window and also has a pantry. The property’s bedrooms are all good sizes and have large windows, meaning that they all have excellent lighting. Three of the four bedrooms have fitted wardrobes. In between two of the bedrooms, there is a bathroom. There could be two doorways opened up making a “Jack and Jill” entrance, meaning that the two bedrooms would turn into en-suites. There is also another toilet at the bottom of the hall. The house comes with a large garage, plenty big enough for a car and for storing things as well. 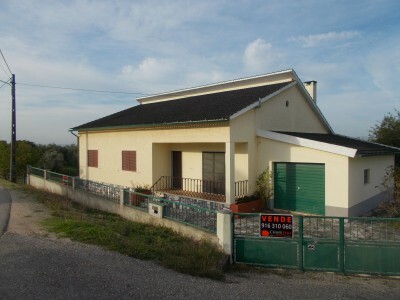 The land that comes with the property measures 1281sqm and has various olive and fruit trees. The house is situated in the village of Junceira which has cafés, mini markets and restaurants in walking distance. The larger town of Tomar, which is home to the UNESCO listed Convento do Cristo, is around 6 kms from the property.